On May 14, 1607, English settlers arriving under the authority of the Virginia Company of London chartered by King James I established the first permanent British settlement in North America at a place they named Jamestown, Virginia. The Jamestown colonists struggled with leadership and survival from the beginning. Captain John Smith spent his first months in Virginia exploring in the Chesapeake region, undergoing capture by the regional Algonquian "great emperor," Powhatan, with whom he subsequently developed a mutually wary and respectful relationship. In 1608 Smith was chosen to be president of Jamestown’s governing council and proved to be an able leader. 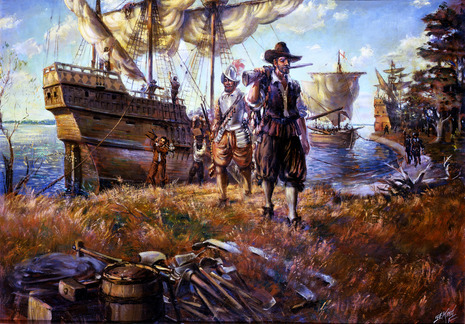 Yet Smith returned to England in 1609, and only 60 of the 214 colonists survived the "Starving Time" of the ensuing harsh winter. The arrival of fresh supplies from England in the spring fortified the colony and enabled it to endure. 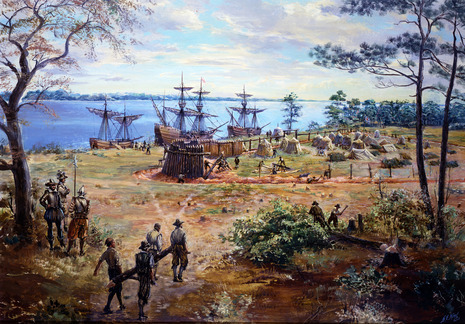 Jamestown, located on Jamestown Island in the Virginia Colony, was founded on May 14, 1607. It is commonly regarded as the first permanent English settlement in what is now the United States of America, following several earlier failed attempts, including the Lost Colony of Roanoke. It was founded by the London Company (later to become the Virginia Company), headquartered in London. Located in James City County when it was formed in 1634 as one of the original eight shires of Virginia, Jamestown was the capital of the Colony for 83 years, from 1616 until 1698. At that time, the capital was relocated to Middle Plantation, about 8 miles (13 km) distant. (That small community, which had also become home to the new College of William and Mary in 1693, was renamed Williamsburg in 1699).